Although Okinawa Island hosts more than 30 U.S. bases – taking up 20% of its land – there has never been a concerted attempt to investigate levels of contamination within them. Unlike other nations with U.S. bases such as South Korea and Germany, the Japanese government has no effective powers to conduct environmental checks, nor does the Pentagon have a duty to disclose to the public any contamination that it knows to exist.8 To date, most incidents of pollution have only become known when individual service members divulge details to the media or, as in the case of the barrels uncovered in Okinawa City, the Japanese authorities conduct tests following the return of military land. Despite their limited scope, such disclosures offer a disturbing window into the contamination of Okinawa. Over the past seven decades, the island’s sea, land and air have been contaminated with toxins including arsenic, depleted uranium, nerve gas and carcinogenic hexavalent chromium. These substances have poisoned Okinawan civilians and U.S. troops alike – and it is highly probable that they are damaging the health of those living on the island today. But, regardless of these risks, the Pentagon continues to do everything it can to evade responsibility for the damage its bases cause. The 1952 Treaty of San Francisco granted the Pentagon full control of Okinawa and, as the military seized large tracts of civilian land to convert into bases, the dangers of pollution grew. Fuel leaks saturated the ground, industrial-grade detergents flowed from runways into nearby streams and solvents were flushed away without regard to where they ended up. Such lax environmental controls were common on U.S. military bases all over the world at this time, but Okinawa’s problems were exacerbated by the geo-political gray zone in which it existed. Throughout the 1945 – 1972 U.S. occupation, the island was not protected by American law or the Japanese constitution, so the Pentagon stored large stockpiles of chemical and atomic weapons there – and nuclear-powered submarines made regular pit-stops to Okinawa. The next year, the Wall Street Journal broke the news of a leak of nerve gas at Chibana Ammunition Depot, near Kadena Air Base, that hospitalized more than 20 U.S. service members. Precise details of the subsequent mop-up operation remained hidden until July this year when U.S. veterans stationed on the island at the time described how tons of the chemical munitions had been dumped off Okinawa’s coast.12 Experts estimate that the metal containers holding these poisons corrode after fifty years, threatening the health of fishing crews and coastal communities today. During the Vietnam War, Okinawa served as the Pentagon’s primary staging post for the conflict. 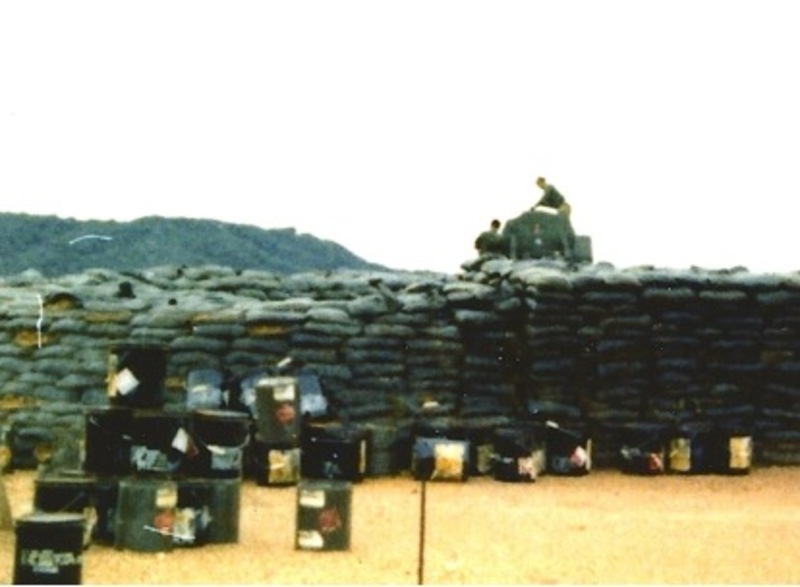 Led by the U.S. Army’s 2nd Logistics Division, the military channeled the majority of its supplies – including ammunition, coffins and, now it seems, Agent Orange – via the island’s ports. This transportation was a two-way street; surplus and damaged materiel was also returned from the war zone to Okinawa for re-processing. Ships offload supplies in 1969 during the Vietnam War at Naha Military Port. Courtesy of Michael Jones. 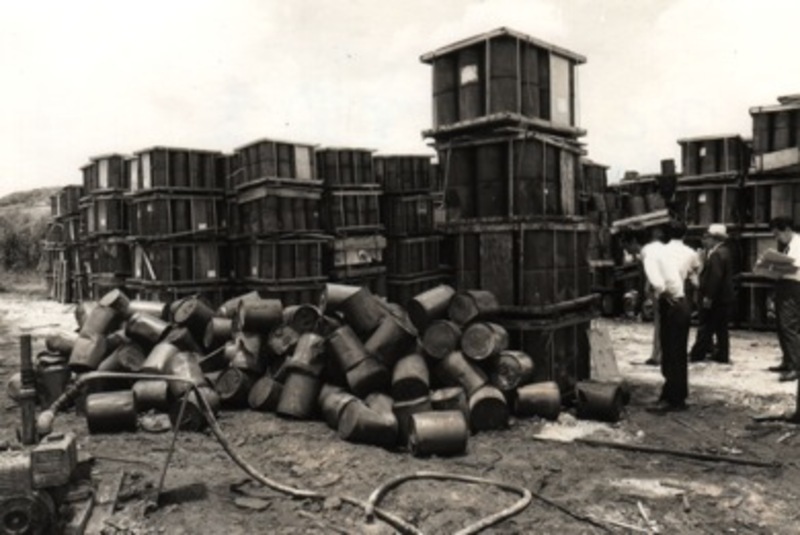 Barrels of unidentified chemicals lie strewn across land in the Northern Training Area, 1972. Courtesy of Robin Poe. Used containers and surplus quantities of ORANGE should be buried in deep pits at locations where there will be the least possibility of agent leaching into water supplies or cultivated crop areas. In September 1974, the U.S. consulate had displayed a similar tone when Okinawa Governor Yara Chobyo voiced fears to the U.S. military that its aging oil pipelines might leak. In a cable, the U.S. consulate in Naha brushed off the governor’s concerns, noting the “pipeline has now been added to leftist catalogue of evils of U.S. base system.”19 A little over a year later – in January 1976 – Yara’s concerns were proven justified when one of the pipelines spilled 14,000 gallons (53,000 litres) of diesel into a local river. In the 1970s, the Pentagon showed more concern over potential PR damage than the risk to human health; today its stance towards the discovery of the dioxin-contaminated barrels in Okinawa City seems identical. Its denials attempt to protect its image of a good neighbour – but its failure to take action potentially sacrifices the health of local Okinawans, its own service members and their dependants. Although the Okinawa City dioxin site is located adjacent to two Department of Defense schools, it appears that the parents and teachers there have not been informed. Okinawa officials visit the dumpsite of U.S. surpluspentachlorophenol herbicides in southern Okinawa, 1971. Used with permission of Okinawa Prefectural Archives. During the 1970s, such neglect could have been blamed on a lack of environmental awareness. However, today in 2013, such a posture is criminal – reminiscent of the contamination of Camp Lejeune, North Carolina, where tens of thousands of troops and family members were exposed to toxins including pesticides, benzene and industrial solvents between 1953 and 1987. The Status of Forces Agreement (SOFA) – the foundation, unchanged since 1960, that spells out the rights and role of the U.S. military in Japan – encourages the Pentagon’s cavalier approach to pollution. Article IV of SOFA absolves the U.S. of all financial responsibility for cleaning up land it has contaminated and does not allow the Japanese authorities to conduct spot-checks on U.S. military bases. In the coming years, it is likely such troubles will become more pressing. In October, Japan’s Minister of Defense, Itsunori Onodera, reiterated plans to concentrate the U.S. military presence in the northern half of Okinawa Island – a move which will entail the closure of several installations including Machinato Service Area, one of the main bases where defoliants were allegedly stored, and – ultimately – MCAS Futenma. Experts have estimated the cost of the cleanup of MCAS Futenma at $600 million – but that was before the cost of Agent Orange remediation had been figured into calculations. Okinawa residents have long protested, calling for a future with fewer bases. But even after their wish becomes a reality, it seems the land they’ve fought so hard to retrieve will be uninhabitable for years – if not decades – to come. This article is an expanded version of one that first appeared in The Japan Times November 12, 2013. The research within it formed the basis of a presentation Mitchell gave to lawmakers, university professors and members of the public at Okinawa Prefectural Assembly on November 11, 2013. Jon Mitchell is an Asia-Pacific Journal associate and visiting researcher at the International Peace Research Institute of Meiji Gakuin University, Tokyo. In 2012, “Defoliated Island: Agent Orange, Okinawa and the Vietnam War” – a Japanese TV documentary based upon his research – was winner of an award for excellence from Japan’s Association of Commercial Broadcasters. Next year, a Japanese-language book based upon his research into Agent Orange on Okinawa will be published in Tokyo. • Jon Mitchell, Were U.S. Marines Used as Guinea Pigs on Okinawa? • Jon Mitchell, Agent Orange on Okinawa: Buried Evidence? 1 “Levels of Agent Orange ingredients found in Okinawa City exceed Environmental Quality Standard,” Ryukyu Shimpo, August 1, 2013. Available here. 2 Jon Mitchell, “‘Deny, deny until all the veterans die’ – Pentagon investigation into Agent Orange on Okinawa,” The Asia-Pacific Journal, Vol. 11, Issue 23, No. 2. June 10, 2013. Available here. 3 Email exchange between Jon Mitchell and Tiffany Carter, Media Relations Chief of USFJ, August 5, 2013. 4 Travis Tritten, “Expert: Chemicals found on Okinawa likely not Agent Orange,” Stars and Stripes, August 15, 2013. Available here. 5 Jon Mitchell, “Okinawa Dumpsite Offers Proof of Agent Orange: Experts Say,” The Asia-Pacific Journal, Issue 38, No. 1, September 23, 2013. Available here. 6 See for example, the investigation by Project Censored (available here ), this report by RT USA and Barry Sanders, The Green Zone: The Environmental Costs of Militarism, AK Press, Oakland, 2009. 7 Lyndsey Layton, “Pentagon Fights EPA On Pollution Cleanup,” The Washington Post, June 30, 2008. Available here. 8 Hayashi Kiminori, Ōshima Ken’ichi and Yokemoto Masafum, “Overcoming American Military Base Pollution in Asia,” The Asia-Pacific Journal, Vol. 28-2-09, July 13, 2009. Available here. 9 “Big Picture: Okinawa: Keystone of the Pacific”, National Archives and Records Administration, Department of Defense. Date unknown. 10 Hayashi Kiminori et al. 11 Karen L. Gatz and Edward C. Keefer, Foreign Relations of the United States, 1964-1968: Japan, vol. XXIX, United States Government Printing Office, Washington, 2006. 276. 12 Jon Mitchell, “Operation Red Hat: Chemical weapons and the Pentagon smokescreen on Okinawa,” The Asia-Pacific Journal, Vol. 11, Issue 30, No. 1. August 5, 2013. Available here. 13 Interviews with author conducted August ~ October 2013. 14 Jon Mitchell, “Vets win payouts over Agent Orange use on Okinawa”, The Japan Times, February 14, 2012. Available here. 15 Jon Mitchell, “US Military Defoliants on Okinawa: Agent Orange,” The Asia-Pacific Journal Vol 9, Issue 37 No 5, September 12, 2011. Available here. 16 Jon Mitchell, “Poisons in the Pacific: Guam, Okinawa and Agent Orange,” The Japan Times, August 7, 2012. Available here. 17 Ryukyu Asahi Broadcasting, “Defoliated Island – Agent Orange, Okinawa and the Vietnam War,” May 15, 2012. Available to watch here. 18 Electronic telegram, “OKINAWA POLLUTION FLAP ON ARMY LEAK OF HEXAVALENT CHROMIUM”, U.S. Consulate Naha, August 25, 1975. 19 Electronic telegram, “OKINAWA GOVERNOR RAISES FUEL PIPELINE WITH USAGO,”U.S. Consulate Naha, September 18, 1974. 21 Jon Mitchell, “Agent Orange revelations raise Futenma stakes,” The Japan Times, October 18, 2011. Available here. 22 “Mongooses near U.S. bases have high PCB levels,” Kyodo, August 19, 2013. Available here. 23 Sakurai Kunitoshi, “Okinawan Bases, the United States and Environmental Destruction,” The Asia-Pacific Journal, November 10, 2008. Available here. 24 For an English language report see: “Asbestos Found in Tower on Camp Courtney,” Japan Update, July 12, 2013. Available here. 25 “PCB waste from US military sites will be disposed in Fukushima,” Japan Press Weekly, September 23, 2013. Available here.